My eldest son baked this. He got the recipe from Flavours latest issue. So, my #2 son and I were gobbling up the slightly warm cake covered in dripping chocolate sauce. Then, #1 son, you two get constipation, not my fault, ok? I put in almost a whole tin of Van Houten chocolate. 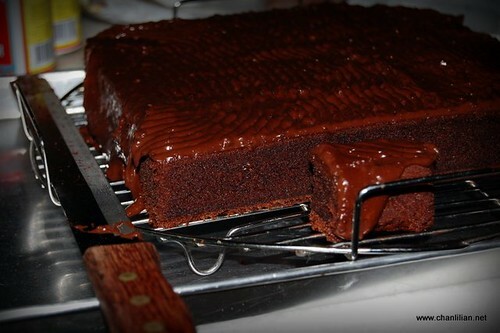 There is a whole slab of chocolate moist cake. Some of the lucky friends will get to eat them cos we don’t want to have the whole family constipated, do we? Then, need to clear the throat and then, make sure the vocal chords are working fine. I am always nervous doing the early morning reading because the voice need to be absolutely fine but it is hard to have normal voice so early. My voice is especially low. 6 am must wake up. Drive so far away to church. Seriously thinking of changing church. But after being ‘born, grow up and maturing’ in CHS, it is very hard to cut off ties. Oh ya, must practise my tongue to roll at the word ‘unparalleled’ . Sigh..the words in a sentence are – great, distress, unparalleled…..after grrrreat distrrrress, it becomes unpararrered that sounds like unparrot. Never mind, have faith in Jesus. He has made someone like me who cannot speaks clearly to be CJ Chan Lilian who dares to talk in front of video camera. And someone who is so so so sked of people to proclaim the Word of God in the stern looking Catholic crowd. Jesus rocks! 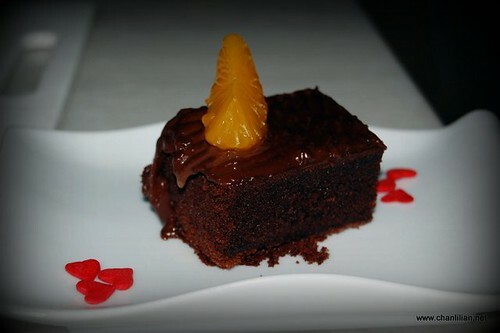 The cake looks really nice and it’s making me salivating… hehehe… do you mind sharing the recipe?? Aiyoh! Next time got extra food hor, call me come lar. When I am on the way to pick up my kids at Lembah Permai, I can always drop by. Next time, share some with me, can? Ok, I admit – I am abit ‘tum chiak’. hehehe………………………. Erina – Sure…next time I call you to sample something I or my son cook, ok? Sabrina – My son baked it, I didn’t see it. But u can buy a copy of Flavours mag and try it.